On Tuesday, UNESCO’s executive board passed a resolution which slammed Zionist regime’s actions in occupied Al-Quds (East Jerusalem) and Gaza Strip, despite a vicious campaign by Israel and its poodles ruling the Western countries to discredit the United Nations’ cultural agency. The resolution, which declared Israel’s sovereignty over Jerusalem null and void was passed by 22:10 votes. Russia, China, Brazil, Sweden, South Africa, Iran, Malaysia, Mauritius, Nigeria, Senegal, Bangladesh, Pakistan, Vietnam, Nicaragua, Chad and seven Arab countries voted in favor of the resolution. The US, Germany, Italy, Britain, Holland, Lithuania, Greece, Paraguay, Ukraine and Togo opposed the resolution while Estonia, France, Slovenia, Spain, India and Japan abstained. The resolution calls the Zionist entity, as the occupying power, to cease persistent excavations, tunneling, works and projects in East Jerusalem, which the Palestinians want as the capital of their future state. It reaffirms the importance of the Old City of Jerusalem and its walls for the three monotheistic religions, while accusing the Zionist regime of taking actions that have altered, or purport to alter the character and status of the Al-Quds. The resolution also criticized the Zionist regime for its blockade on the Hamas-governed Gaza Strip since 2007. Zionist regime, however, succeeded in gaining more support among the member states than it did in a similar resolution last year. Last year only six member-nations had supported the Zionist entity. The resolution was submitted by Egypt, Lebanon, Morocco, Sudan, Algeria, Oman and Qatar. Among these countries, only Lebanon supports Hamas. As expected, both Tel Aviv and Washington called the UNESCO’s decision biased and not binding on the Zionist entity. The executive board decision now goes to the plenary, which will consider the issue on Friday. “We understand very well that we are struggling against a huge power supported by many countries, including the US. And we know that our success will be cumulative – step by step, stone by stone,” Dr. Mustafa Barghouti, General Secretary the Palestinian National Initiative said in a statement. The Geneva-based UN Watch has its own ambassador at United Nations. Enjoy below the professional liar white-washing Israeli crimes at UNESCO meeting. As far the Zionist’s whining, “Algeria, where are your Jews?” They came with the French occupiers and majority of them left Algeria along with the French occupiers. No Muslim majority country followed European expulsion of Jewry. Jews left Arab countries for Israel as result of Zionist Jewish terrorism (here, here, here, here). The UN Watch’s executive director Hillel Neuer has thanked India for distancing itself from anti-Israel Arab countries. Historically, Jerusalem existed under the name Salem during the time of prophet Abraham 3000 years ago – and Abraham was certainly not an Israelite or a Jew. The entire city was demolished by Babylonians in 586 BC. It was rebuilt seventy-year later by Cyrus, the King of Persia, who could not be a Jew. In 40 BC Romans occupied Jerusalem and incinerated the Temple of Solomon (Masjid-e-Aqsa, mentioned as the Far-away mosque in the Holy Qur’an. Palestine has existed, though not as an independent state, for over 10,000 years. Its inhabitants have been Jebusites (the ones’ who most probably built the city), Cannanites, Phoenicians, Hittites, Aramaeans, Ammonites, Moabites, Edomites, Arabs, Franks and Turks. Part of Palestine was ruled by King Solomon under the name of Kingdom of Judea and Samara until it was conquered by Babylonians, Greeks, Romans and Persians between 171 BC and 135 CE. The City of Jerusalem was handed over to Muslim Arab forces by the Christian Patriarch Sofronius in 637 CE. Muslims found the ruins of Temple of Solomon used as the city garbage dump. 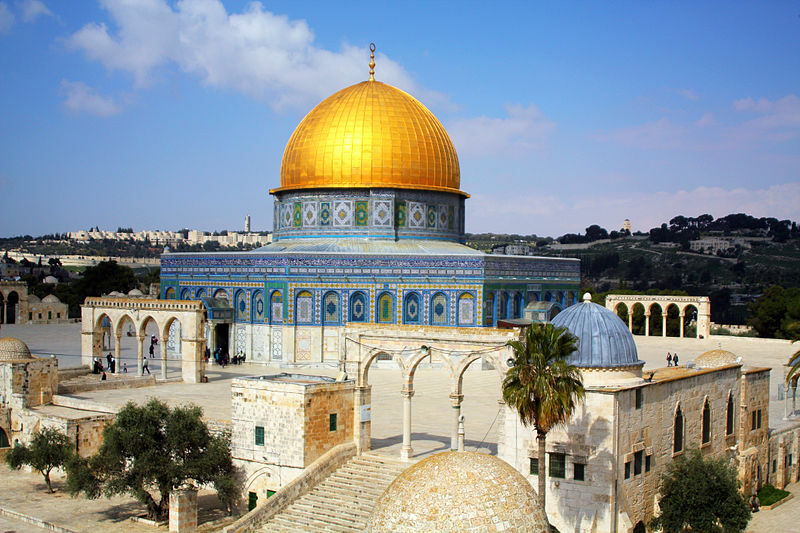 Under the orders of Caliph Umar Ibn Khattab (ra), the site was cleaned of garbage and handed-over to the Chaief Rabbi of Jerusalem, who in gratitude declared the Caliph as the Promised Jewish Messiah. Sheikh Imran Nazar Hossein in his book Jerusalem in the Quran exposes the Zionist lies about their Biblical claim on the Holy Land. Let me explain it in a simple way; Christian West tried for 2000 years to solve their Jewish problem – but ended up losing their religion and national sovereignty to organized Jewry. Now, majority of 193 members of United Nations and four out of five veto powers at UNSC are Christians – so your guess is as good as mine. I guess this means that the Muslims are not as fast on the uptake as the Europeans, although, sadly, the Europeans’ have no “sticktoitveness”….